Goalkeeper Lee Butcher saved two penalties as 10-man Leyton Orient beat Southend 4-3 in a shoot-out to reach the second round of the Carling Cup. Butcher kept out spot-kicks from Liam Dickinson and JP Kalala before Jamie Cureton converted the winning penalty. Michael Richardson had headed the O's in front from 12 yards but Mark Phillips nodded in to level. Orient then had Jonathan Tehoue sent off for headbutting Luke Prosser but Butcher's heroics helped them through. "We've very disappointed, with having an hour of being able to play against 10 men. "(We had) several chances, I thought their goalie had an excellent performance. "We put a reasonable performance in, it was just our final finish that let us down." 124:59 Penalty scored by Jamie Cureton. Southend 3-4 Leyton Orient on penalties. 124:30 Ryan Hall scores a penalty. Southend 3-3 Leyton Orient on penalties. 123:55 Penalty taken by Michael Richardson saved by Glenn Morris. 123:08 Power penalty taken by JP Kalala saved by Lee Butcher. 122:33 Penalty scored by Ben Chorley. Southend 2-3 Leyton Orient on penalties. 122:13 Penalty scored by Sean Clohessy. Southend 2-2 Leyton Orient on penalties. 121:46 Charlie Daniels scores a penalty. Southend 1-2 Leyton Orient on penalties. 121:15 Neil Harris scores a penalty. Southend 1-1 Leyton Orient on penalties. 120:35 Penalty scored by Elliot Omozusi. Southend 0-1 Leyton Orient on penalties. 120:02 Penalty taken by Liam Dickinson saved by Lee Butcher. 120:00+0:21 The match is going to penalties. 119:23 Booking The referee shows Elliot Omozusi a yellow card for time wasting. 118:29 Booking Ben Chorley receives a yellow card for unsporting behaviour. 118:29 Booking Bilel Mohsni booked for unsporting behaviour. 116:55 Corner taken left-footed by Ryan Hall to the near post, Graham Coughlan challenges Ben Chorley unfairly and gives away a free kick. Lee Butcher takes the direct free kick. 116:16 Corner taken by Ryan Hall played to the near post, clearance made by George Porter. 116:11 Liam Dickinson sends in a cross, clearance made by Scott Cuthbert. 115:01 Booking Lee Butcher is cautioned by the ref for time wasting. 113:35 Outswinging corner taken by Charlie Daniels, Unfair challenge on Glenn Morris by George Porter results in a free kick. Glenn Morris restarts play with the free kick. 110:53 Lee Sawyer takes a shot. Lee Butcher makes a comfortable save. 110:37 Free kick awarded for an unfair challenge on Anthony Grant by Elliot Omozusi. Free kick taken by Luke Prosser. 109:23 Shot from outside the box by Anthony Grant goes wide right of the target. Correction - 109:13 Centre by Ryan Hall, clearance by Ben Chorley. 109:13 Centre by Ryan Hall, Scott Cuthbert makes a clearance. 107:26 Neil Harris sends in a cross, Headed effort from deep inside the penalty area by Bilel Mohsni goes harmlessly over the crossbar. 106:22 Lee Butcher takes the free kick. 106:22 Substitution Terrell Forbes replaces Dean Cox. 106:22 Foul by Anthony Grant on Elliot Omozusi, free kick awarded. 105:48 Centre by Ryan Hall, Scott Cuthbert manages to make a clearance. 105:01 Substitution Anthony Grant on for Kane Ferdinand. 103:49 Free kick awarded for an unfair challenge on Jamie Cureton by Sean Clohessy. Lee Butcher takes the direct free kick. 103:31 George Porter is penalised for handball and concedes a free kick. Graham Coughlan takes the direct free kick. 102:49 Centre by Sean Clohessy, Liam Dickinson takes a shot. Ben Chorley makes a clearance. 100:48 Kane Ferdinand takes a shot. Save by Lee Butcher. 99:32 Liam Dickinson has an effort direct from the free kick. 99:32 Booking The referee shows Scott Cuthbert a yellow card. 99:26 Free kick awarded for a foul by Scott Cuthbert on Liam Dickinson. 98:34 Outswinging corner taken by Ryan Hall from the left by-line. 98:23 Kane Ferdinand takes a shot. Save made by Lee Butcher. 98:04 Sean Clohessy delivers the ball, Liam Dickinson takes a shot. Lee Butcher makes a save. 96:37 Graham Coughlan challenges George Porter unfairly and gives away a free kick. Lee Butcher restarts play with the free kick. 96:05 Corner taken left-footed by Ryan Hall from the left by-line, Scott Cuthbert manages to make a clearance. 94:55 Ryan Hall crosses the ball, save made by Lee Butcher. 94:07 The ball is swung over by Dean Cox, save by Glenn Morris. 93:02 Bilel Mohsni gives away a free kick for an unfair challenge on George Porter. Charlie Daniels restarts play with the free kick. 90:00+4:21 The match has reached the end of normal time. 90:00+2:44 Scott Cuthbert produces a header from deep inside the six-yard box that clears the crossbar. Correction - 90:00+1:55 Graham Coughlan gives away a free kick for an unfair challenge on George Porter. Charlie Daniels takes the direct free kick. 90:00+1:55 Free kick awarded for an unfair challenge on George Porter by Graham Coughlan. Direct free kick taken by Charlie Daniels. 90:00+1:25 Booking Michael Richardson receives a yellow card for unsporting behaviour. 90:00+1:16 Unfair challenge on JP Kalala by Michael Richardson results in a free kick. Free kick taken by Bilel Mohsni. 90:00+0:58 Ryan Hall takes a shot. Save made by Lee Butcher. 90:00+0:35 Ryan Hall takes a shot. Save by Lee Butcher. 89:54 Scott Cuthbert concedes a free kick for a foul on Liam Dickinson. Free kick taken by Sean Clohessy. 88:43 Luke Prosser crosses the ball, Lee Butcher makes a save. 87:47 Foul by Liam Dickinson on Scott Cuthbert, free kick awarded. Lee Butcher takes the free kick. 87:31 Sean Clohessy produces a cross, Elliot Omozusi manages to make a clearance. 85:06 The ball is crossed by Luke Prosser, Lee Butcher makes a save. 84:09 Foul by Kane Ferdinand on Dean Cox, free kick awarded. Direct free kick taken by Scott Cuthbert. 82:50 Substitution Jamie Cureton replaces Alex Revell. 82:22 Header from deep inside the area by Kane Ferdinand goes over the bar. 82:02 Free kick awarded for an unfair challenge on Ryan Hall by Michael Richardson. Bilel Mohsni takes the direct free kick. 81:24 Effort from a long way out by Ryan Hall goes wide right of the target. 80:18 Lee Sawyer produces a right-footed shot from just outside the box that misses to the right of the target. 78:33 Sean Clohessy challenges George Porter unfairly and gives away a free kick. Free kick crossed by Dean Cox, Glenn Morris makes a save. 76:54 Unfair challenge on Sean Clohessy by George Porter results in a free kick. Direct free kick taken by Glenn Morris. 76:06 The referee blows for offside. Glenn Morris takes the direct free kick. 75:15 Substitution George Porter is brought on as a substitute for Matthew Spring. 74:40 Sean Clohessy sends in a cross. 73:53 The ball is sent over by Alex Revell, save by Glenn Morris. 71:14 The ball is crossed by Sean Clohessy, Ben Chorley makes a clearance. 70:28 The ball is swung over by Lee Sawyer, Lee Butcher makes a save. 69:21 Substitution Lee Sawyer replaces Jemal Johnson. 68:41 Corner taken by Ryan Hall played to the near post, Lee Butcher makes a save. 68:19 Sean Clohessy delivers the ball, Matthew Spring makes a clearance. 67:16 The ball is swung over by Luke Prosser, Neil Harris takes a shot. Blocked by Scott Cuthbert. 66:27 The ball is swung over by Elliot Omozusi, Glenn Morris makes a save. 66:08 A cross is delivered by Sean Clohessy, Matthew Spring makes a clearance. 64:05 Effort on goal by Neil Harris from just outside the area goes harmlessly over the target. 61:00 Graham Coughlan fouled by Dean Cox, the ref awards a free kick. Glenn Morris takes the direct free kick. 59:48 Sent off Jonathan Tehoue is shown a red card for violent conduct. 57:57 Ryan Hall takes a shot from a long way out which goes wide of the right-hand upright. 57:03 Unfair challenge on Liam Dickinson by Charlie Daniels results in a free kick. Direct free kick taken by Bilel Mohsni. 53:45 Jemal Johnson gives away a free kick for an unfair challenge on Charlie Daniels. Charlie Daniels takes the free kick. 49:14 Jonathan Tehoue takes a shot. Glenn Morris makes a comfortable save. 47:54 Ryan Hall takes a shot. Save by Lee Butcher. 47:32 Elliot Omozusi sends in a cross, clearance by Bilel Mohsni. 46:48 Header by Neil Harris from deep inside the penalty area misses to the left of the target. 46:29 Ryan Hall sends in a cross, Michael Richardson manages to make a clearance. 45:01 Substitution Mark Phillips leaves the field to be replaced by Bilel Mohsni. 45:00+0:59 The half-time whistle blows. 43:28 Ryan Hall has a shot on goal from outside the box which misses right. 42:58 Ryan Hall takes a corner. 42:44 Ryan Hall takes a shot. Clearance made by Elliot Omozusi. 40:14 Headed effort on goal by Jemal Johnson from just inside the box goes harmlessly over the target. 39:00 Dean Cox has an effort at goal from just outside the box which goes wide of the right-hand upright. 38:17 Corner taken by Ryan Hall from the left by-line, clearance by Michael Richardson. 38:02 JP Kalala takes a shot. Clearance by Jimmy Smith. 37:29 Unfair challenge on Kane Ferdinand by Jimmy Smith results in a free kick. Free kick taken by Graham Coughlan. 35:25 The ball is sent over by Charlie Daniels, Jonathan Tehoue produces a left-footed shot from deep inside the penalty area which goes wide of the left-hand post. 31:52 Ryan Hall provided the assist for the goal. 31:52 GOAL - Mark Phillips:Southend 1 - 1 Leyton Orient Mark Phillips grabs a headed goal from inside the penalty box. Southend 1-1 Leyton Orient. 30:51 Booking Dean Cox is shown a yellow card. Correction - 30:42 Unfair challenge on Jemal Johnson by Dean Cox results in a free kick. 30:42 Dean Cox gives away a free kick for an unfair challenge on Jemal Johnson. Direct free kick taken by Ryan Hall. 29:38 Free kick awarded for a foul by Alex Revell on Mark Phillips. Glenn Morris takes the free kick. 28:31 Foul by Jimmy Smith on Sean Clohessy, free kick awarded. Direct free kick taken by Ryan Hall. 28:21 Jemal Johnson produces a cross, clearance by Jimmy Smith. 25:40 A cross is delivered by Charlie Daniels, clearance made by Mark Phillips. 23:38 Michael Richardson takes a shot. Mark Phillips gets a block in. 22:08 Assist by Alex Revell. 22:08 GOAL - Michael Richardson:Southend 0 - 1 Leyton Orient Michael Richardson finds the back of the net with a headed goal from inside the box. 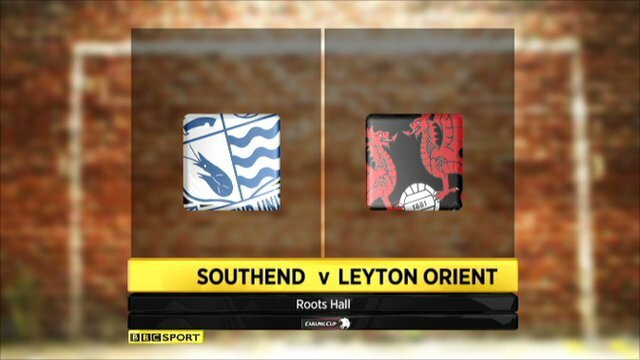 Southend 0-1 Leyton Orient. 19:48 Jonathan Tehoue takes a shot. Glenn Morris makes a save. 18:35 Charlie Daniels challenges Liam Dickinson unfairly and gives away a free kick. Glenn Morris takes the direct free kick. 17:34 Effort on goal by Neil Harris from just inside the area clears the crossbar. 16:27 Inswinging corner taken by Dean Cox from the left by-line, Headed effort from inside the box by Jimmy Smith misses to the right of the target. 16:20 Dean Cox crosses the ball, Graham Coughlan makes a clearance. 15:51 The ball is delivered by Sean Clohessy, save by Lee Butcher. 10:49 Free kick awarded for an unfair challenge on Jonathan Tehoue by Mark Phillips. Direct free kick taken by Lee Butcher. 9:23 Liam Dickinson concedes a free kick for a foul on Scott Cuthbert. Lee Butcher takes the direct free kick. Alex Revell produces a right-footed shot from just outside the box that misses to the right of the net. 8:10 Foul by Jimmy Smith on JP Kalala, free kick awarded. Glenn Morris takes the free kick. 6:44 Shot by Ryan Hall. Save by Lee Butcher. 3:55 Ryan Hall takes a inswinging corner to the near post, clearance made by Ben Chorley. 3:23 Liam Dickinson fouled by Ben Chorley, the ref awards a free kick. Free kick taken by Ryan Hall. 0:27 Effort on goal by Michael Richardson from deep inside the penalty area misses to the right of the target.